Price: $59990 - A Classy Look! We are pleased to offer you a very desirable combination, the quintessential Red with White Coves. It is equipped with the rare Powerglide Automatic transmission, coupled to a NOM 350/300 engine in great running condition with correct air cleaner. Paint appears fresh with a few imperfections, but overall, very nice quality as seen in the pics. Chrome bumpers seem to be recently re-chromed. Interior, dash, door panels, carpet are in very good condition, only with minimal signs of wear. Gauges are original, per seller. Very good soft top with clean frame. Trunk has correct wood tire board and rubber mat. Wheels have the original hubcaps with Coker white wall radial tires. Frame is very clean, solid and rust-free with recent paint, also a new exhaust. Car performs very nicely with no issues. Located in TN, we can arrange with delivery nationwide and international. 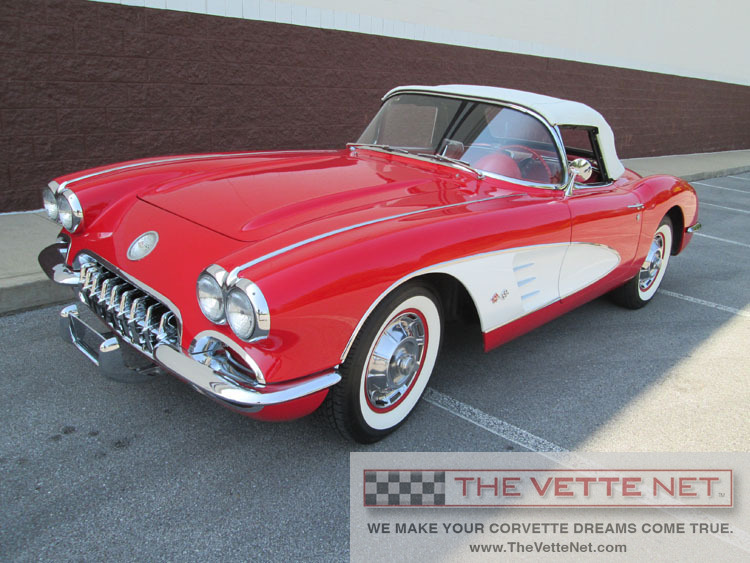 Corvette trades are considered, also, financing is available.